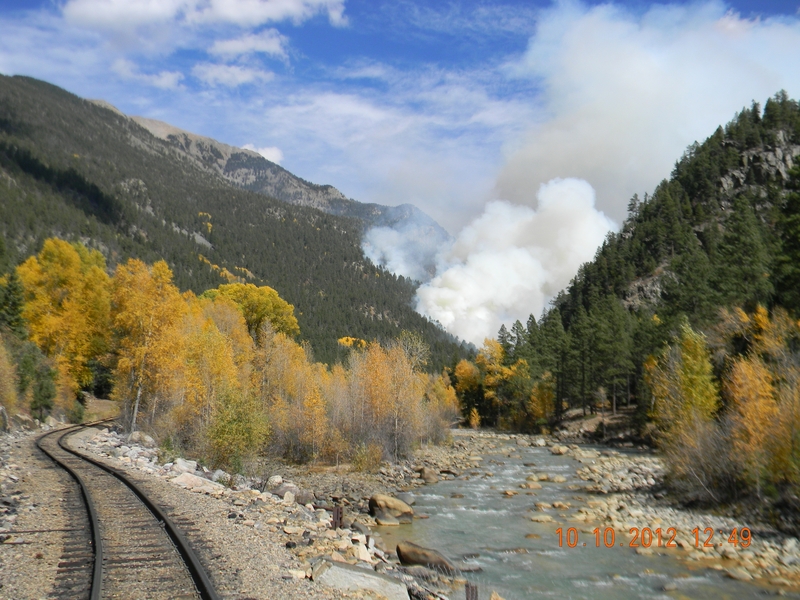 The 2012 fire season in Durango Zone was the busiest in ten years. A less than average snowpack in the San Juan Mountains melted off some six weeks early in the spring, so conditions started out dry. 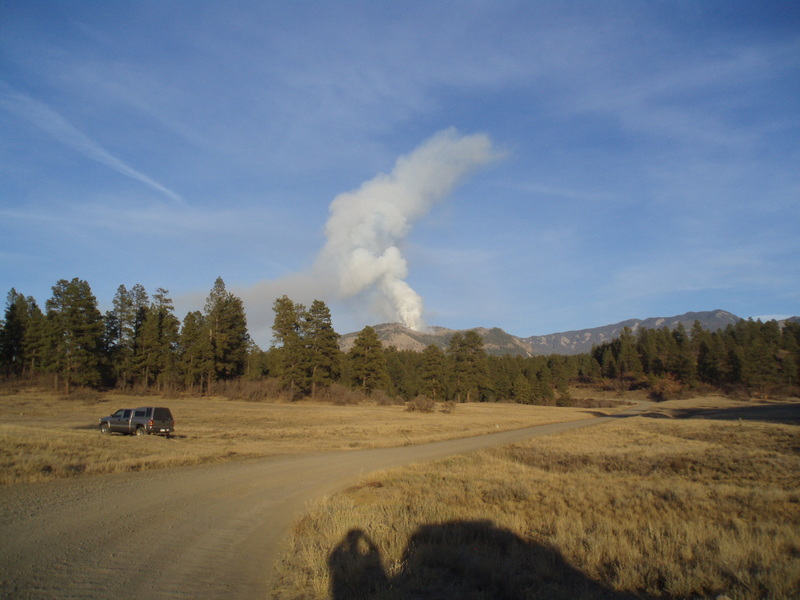 The first fire of the year, East Fork, burned 25 acres in early April at an elevation of 8500 feet on the Pagosa District. This was a precursor of the extreme fire season to come. A lightning storm moved through the Durango region on May 12, quite unusual for that time of year. Seven fires popped up in the zone, including one near Little Sand Creek north of Pagosa Springs. The Little Sand fire was reported to be burning in an inaccessible area of the Piedra drainage in heavy dead and down timber. 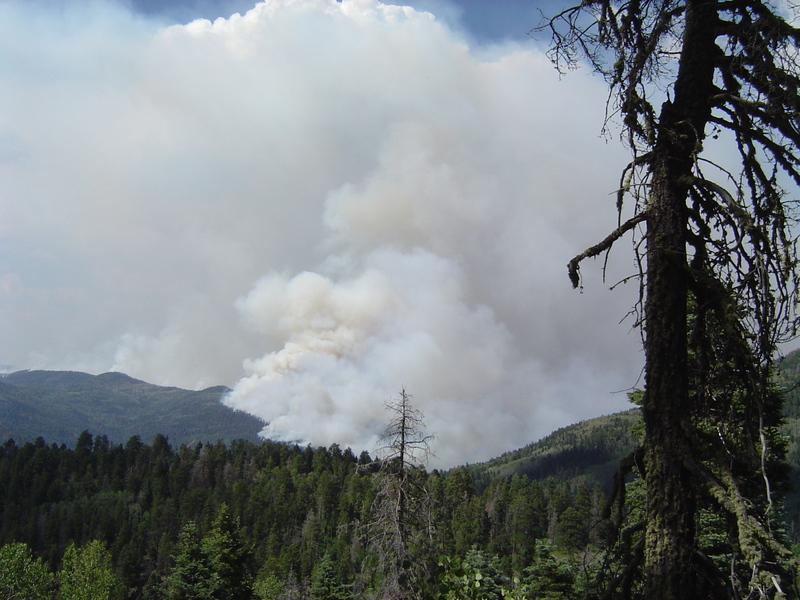 Wildfire Decision Support System (WFDSS) analysis led to a decision by resource managers to monitor and manage the fire rather than fully suppressing it. After a week, it was still only ten acres in size. Then on May 22 it began to move and grow. Before the summer was over, Little Sand hosted a Type 2 team, two Type 3 teams, and a National Incident Management (NIMO) team. 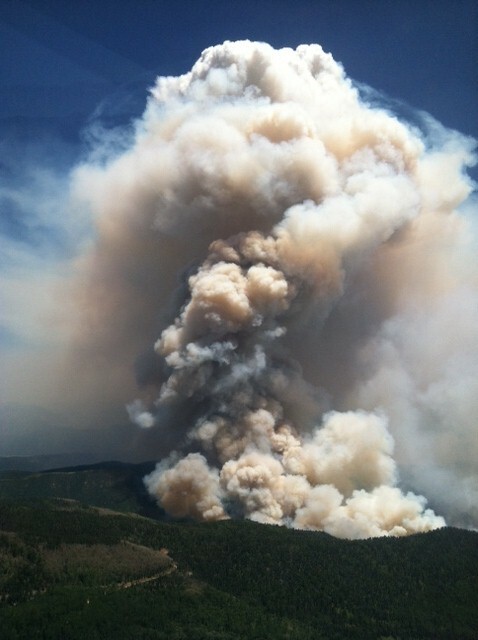 It reached a size of 24,133 acres, making it the largest fire on the San Juan National Forest since 2002. June was a month of record dryness. Both the Burning Index and the Energy Release Component stayed above the 97th percentile across the zone. Fire restrictions were put in place. A human-caused fire on June 22 began on BLM land and quickly moved onto private land in Montezuma County. 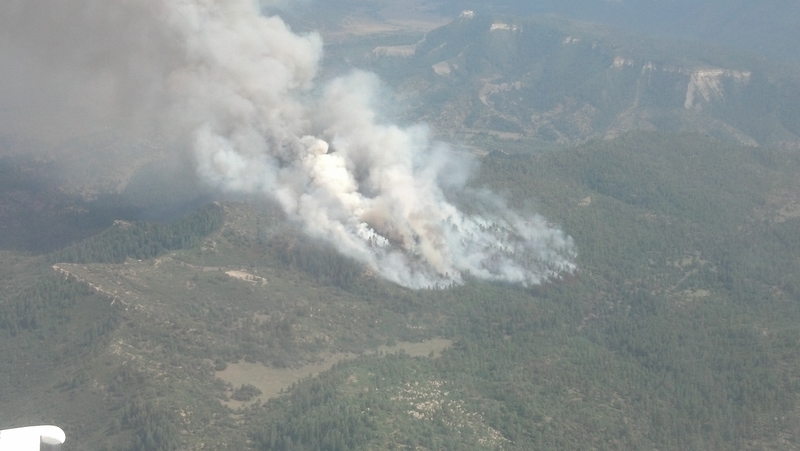 The Weber fire grew over 700 acres on the first day. Over 100 homes were immediately threatened and evacuations began. A Type 2 team was ordered. Rapid response from aircraft, crews, and engines kept structure losses to one outbuilding, but the fire burned 10,100 acres just north of Mancos before it was controlled a month later. 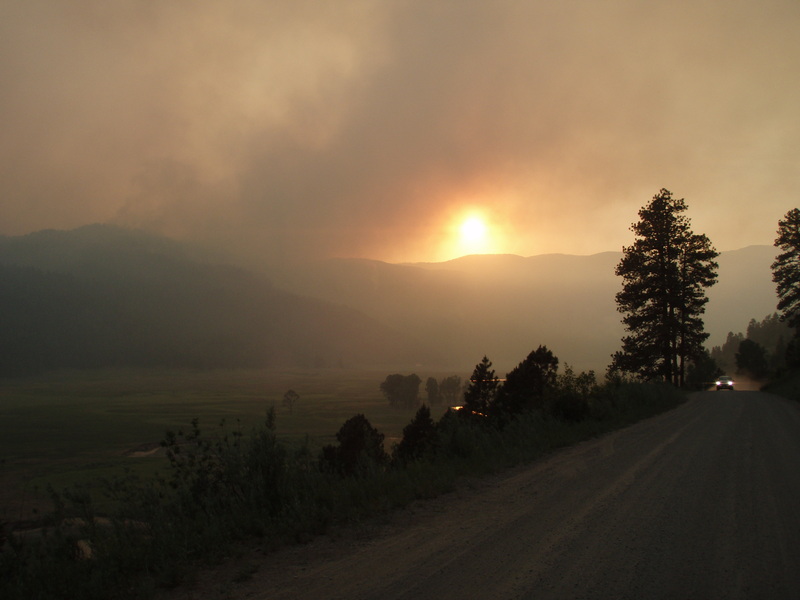 The next day, the State Line fire started near Bondad Hill on La Plata County and Southern Ute land. The Type 3 team deployed to that fire and held it to 350 acres, again narrowly avoiding destruction of several nearby residences. Lightning ignited numerous new fires in late June. Quick response by resources diverted from Little Sand and Weber kept these fires from growing to hundreds of acres. Finally, some rain arrived along with the lightning to slow down the spread of fires. However, precipitation was spotty, as evidenced by the Air Park fire on Southern Ute lands which took everyone by surprise in late July. 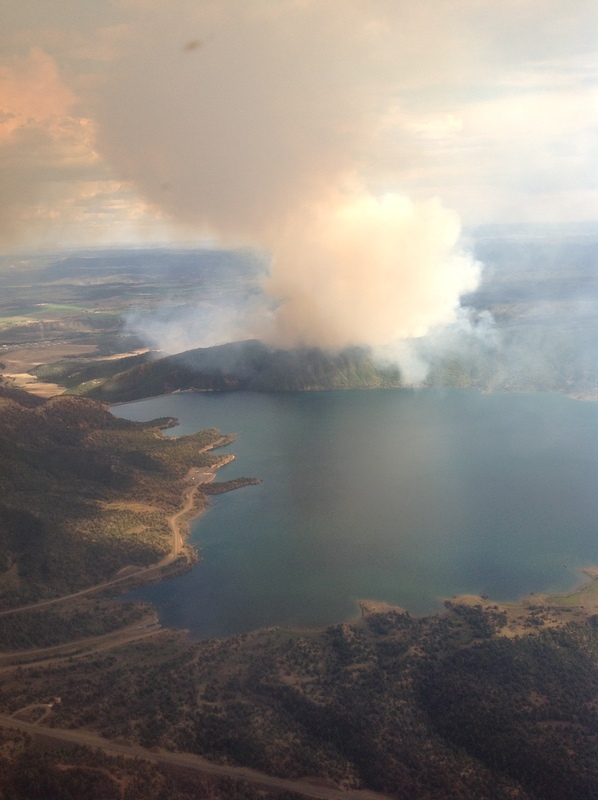 This lightning fire near Nighthorse Reservoir burned in an area that had been missed by the summer rains. It quickly spread to 500 acres, threatening 150 residences and 20 oil and gas wells. August lightning ignited several extended attack fires from 5 to 40 acres in the Ute Mountain region, as well as one more large fire, Burns, which charred 170 acres on Archuleta County. Finally the intermittent monsoon rains dampened enough of the zone to slow ignitions, and many of the zone resources headed north to Idaho, Montana, and northern California to assist on project fires up there. By mid-August, Durango Dispatch had been in service 24 hours a day, 7 days a week, for nearly three months straight. Both Expanded Dispatch and Buying Teams operated continuously out of the Sonoran Rooms of the Public Lands Center. Between the Initial Attack operation and Expanded Dispatch, some 50 dispatchers came in from all over the country to help staff and support the ongoing fire activity. It was not until early September that all the excess dispatch personnel were demobilized. Things appeared to calm down, but that was not the end of the story. The 2012 fire season still had one more big trick up its sleeve. On October 12, the zone received over 9,000 lightning strikes, again an anomaly for that time of year. Between October 5 and November 4, a total of 40 fires were reported in the zone. Four of the fall fires went large. The biggest of these topped 1400 acres. Expanded Dispatch and the Buying Team re-convened; local Type 3 teams were deployed to both Vallecito and Roatcap. Extended attack also lasted for several days on the lightning-caused Little East and Cinnamon Bear fires, as well as the railroad-caused Goblin. The zone ordered engines, crews, helicopters and air tankers to suppress these fires. No one in Durango can remember ever fighting fires to that extent or magnitude, so late in the year. Balmy temperatures marked the entire month of November, and there was zero snow pack in the mountains below 9,000 feet at Thanksgiving. As of mid-December, two large fires on the San Juan still smoldered, not having received enough precipitation to be called out. Overall 2012 was a successful year for one so busy. New Division Supervisors, Task Force Leaders, Type 3 Incident Commanders, and Initial Attack Dispatchers became qualified, while other firefighters opened task books to begin working on higher qualifications. The Durango Zone partner agencies hosted over 100 engines and 25 crews from as far away as Alaska, West Virginia, and Pennsylvania. At one point in late June, five air attack ships, four single engine air tankers, and ten helicopters were simultaneously working fires in the zone. For all this activity, only a handful of minor incidents were reported. It is commendable that everyone kept safety in the forefront during a year that was extremely busy not only here but everywhere in the Rocky Mountain geographic area.